The old organic or ‘bio’ Xinomavro vineyards are situated at the heart of the Aghios Panteleimonas area. We are most proud of a 100 year old plot at 'Sotirtsko' - ungrafted, of course: a 0,25 hectare vineyard that yields only 500kg of the finest grapes one can imagine. That is not more than 1000 bottles per hectare! From these grapes we produce about 300 bottles of dark, ruby-red, outrageously complex wine that can age for at least 25 years - unless the sparrows hit the vineyard first, like in 2009 and 2010, when they left us with only 25kg of grapes. This vineyard was planted when Greece was still under Turkish occupation, it is at least 150 years old. Next to this vineyard, where the soil is more sandy, lies a 0,25 hectare, 40-year-old ungrafted Xinomavro site that is perfect for our Terra Levea rose wines. There are two vineyards (age 25 and 40 years) at Rasto , 0,7 hectares in total. Rasto is the heart of 3000 years of vineyards and winemaking in the area. These grapes are used for our Domaine Karanika Red and Terra Levea Red that are blended with Limniona and a dash of Cabernet. Then we have the 0,5 hectare xinomavro vineyard at 'Dromos Lakkias' , near Amyndeon village close to a pine forest. The 25 year old vines are perfect for our sparkling Karanika Brut. Our last ‘old‘ xinomavro vineyard is a tiny one of 0,1 hectare at Nivigratsko, between Amyndeon and Lake Petres, also used for the Karanika Brut. 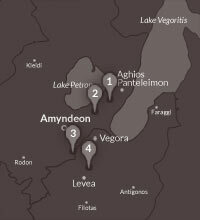 The vineyard surrounding the winery has 3,0 hectares of Limniona, Assyrtiko and Cabernet near the village of Levea. Heavy alluvial soil, because until 5 decades ago, the shores of Lake Vegoritis stretched until here. We practice biodynamic farming on this vineyard and the adjacent 2,0 hectare of fruit trees and vegetable garden. Just 300 meter to the west of the winery there is this small area that is called Ampelotopi, the place where the villagers from Levea, since ancient times, used to have their vineyards. In 2016 we managed to acquire 4 (!) plots of land there (in total 3 hectares) of which we will plant 1,5 hectare of Assyrtiko and Xinomavro in Spring 2017. South facing slopes, very rich in calcium, sandy lime soil with subsoil of marl and limestone. This will give so much more minerality especially to our white sparklers. These vineyards will be Biodynamic from the day of plantation.